An easy-to-make flatbread topped with a flavorful lemon artichoke pesto, diced grilled chicken and smoky Gouda cheese then baked until it’s golden brown and gooey, cheesy delicious. In a large mixing bowl, combine 1½ cups flour, yeast, and salt. Add warm water and oil to flour mixture. Blend at low speed until moistened; beat 1 minute at medium speed. Switch to the dough hook and gradually mix in remaining flour to make a smooth dough, add more or less flour as necessary. Knead for 5 minutes. While dough is rising, preheat oven to 450°F with a pizza stone on the center rack. Punch the dough down, and divide dough in to 2 pieces. Shape each piece into a ball. Let dough rest five minutes covered. Use your hands to flatten each piece of dough into a large oval shape about ¼ inch thick on a piece of parchment paper. To make Artichoke Lemon Pesto: Pulse all ingredients in a small food processor until well blended. Spread 3 tablespoons pesto on each oval. 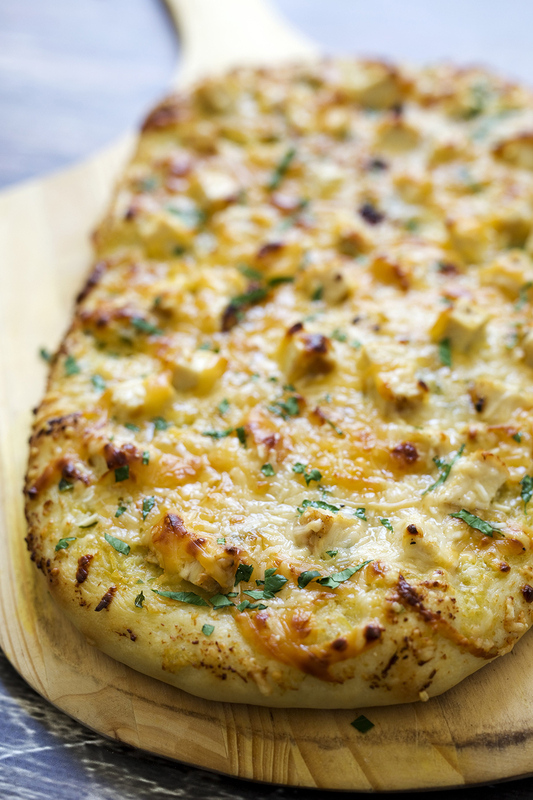 Top each flatbread with half of the chicken, Gouda and Parmesan cheeses.